The March 12th, 2012 issue of OK! Magazine features the cover story ‘Angie & Brad’s new crisis – the fight that stopped the wedding.’ The magazine claims that Angelina Jolie and Brad Pitt’s 10-year-old son Maddox Jolie-Pitt asked Brad who Jennifer Aniston was. This forced Brad to have to spill all the details of their past. When Angelina heard this all caused an explosive argument which put the brakes on the wedding plans and put them to a screeching halt! The actress, 36, was livid with Brad, 48, for a number of reasons. “Brad thought he had taken all necessary precautions and never suspected the kids would learn about his past by coming across a story about Jennifer,” says the insider. As Celeb Dirty Laundry previously reported Angelina and Brad have censored what the Jolie-Pitt kids can look up online to avoid problems like this. Brad’s told German magazine Bild how they’re keeping their private lives off limits ‘On all the kids’ computers we had our names blocked. They can’t Google their mom and dad. I don’t want to make myself dependent on what other people think‘. It looks like their efforts of censoring the kids may have failed. Also included in this week’s magazine Kim Kardashian is certain that she can show that Kris Humphries is a big liar and their marriage was real and not fake like Kris claims. 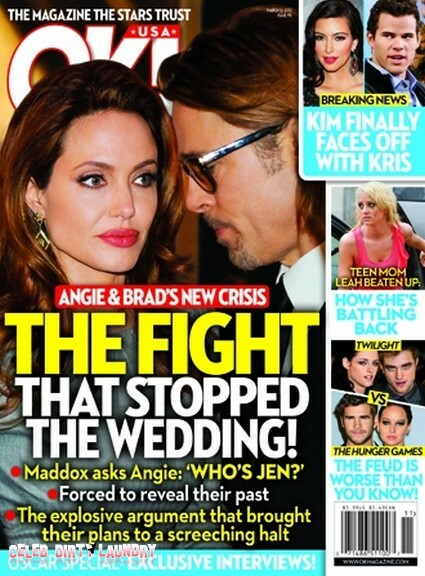 To find out all the details of Bead and Angelina’s big fight that stopped the wedding, pick up the current issue of OK! Magazine on stands Thursday!